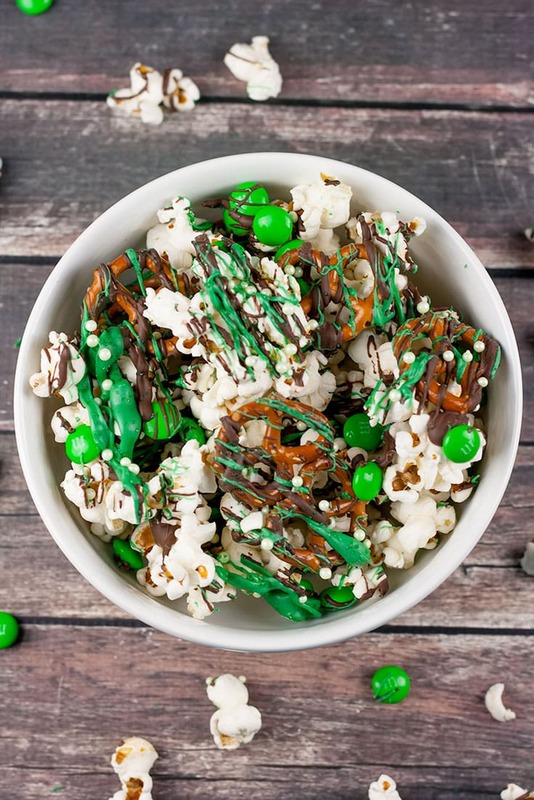 Simple St. Patrick’s Day Popcorn Snack Mix! Perfect for some St. Patrick’s Day fun! I love how simple this snack mix is to make. The most difficult part is popping the popcorn. Let me tell you a story on that. HA! My popcorn popper was broken, so I decided to try and pop it in a pan on the stove. Do not try and make it with vegetable oil. Talk about a smokey house and burnt popcorn. Bad idea. If you pop popcorn on the stove, I recommend using coconut oil. It gave it great flavor and tastes good with the snack mix. By the way, this popcorn popper is on my wishlist! See full recipe in printable recipe card below. Measure out all ingredients before starting. 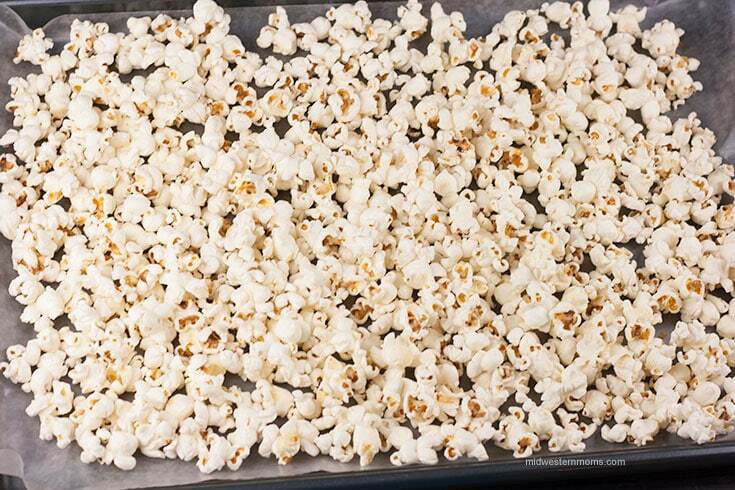 After popping your popcorn, lay it out on a large cookie sheet covered in wax paper. 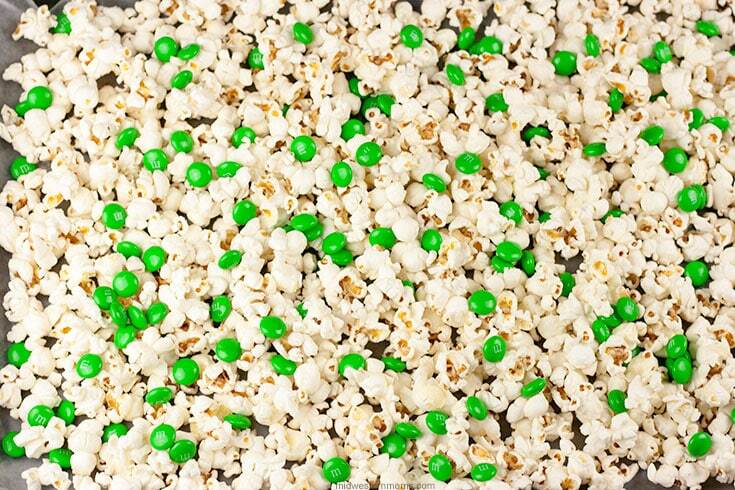 Sprinkle the green M&Ms over the popcorn. 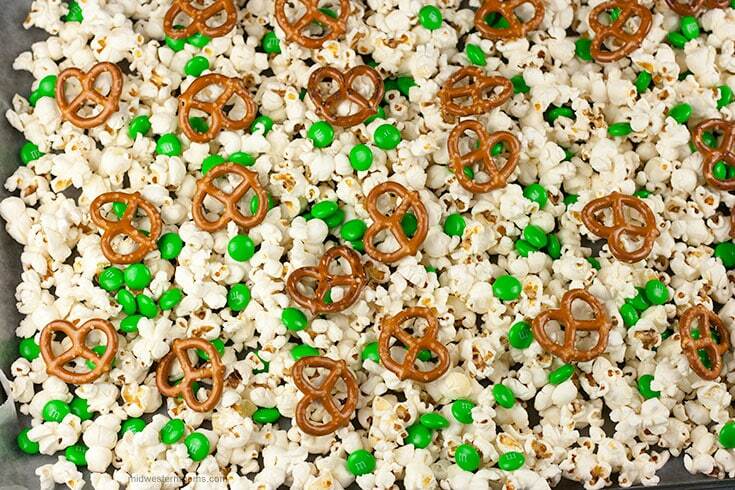 Spread the pretzels over the popcorn and M&Ms. 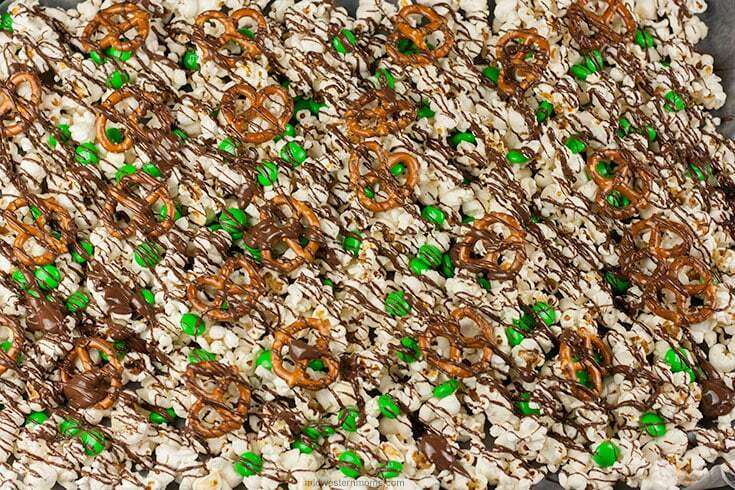 Melt your dark chocolate melting wafers and drizzle it across the popcorn. 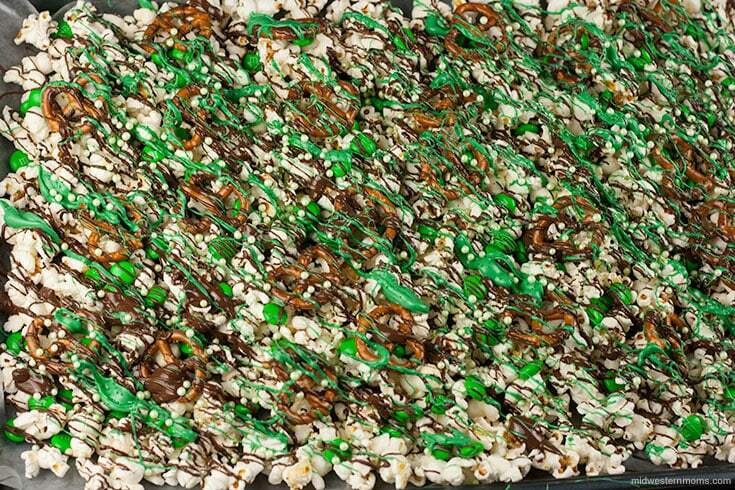 Melt the green candy melts and drizzle over the top of the popcorn. 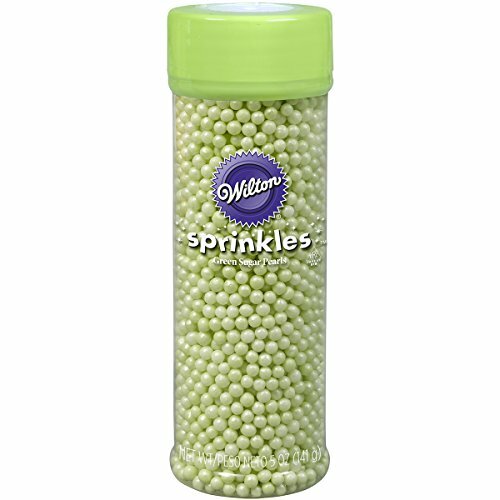 Add sprinkles on the top while the drizzle is still wet. Allow the drizzle to harden before serving. Store in airtight container. Want a cute treat box to put this delicious popcorn snack mix in? Check out how cute this one is. 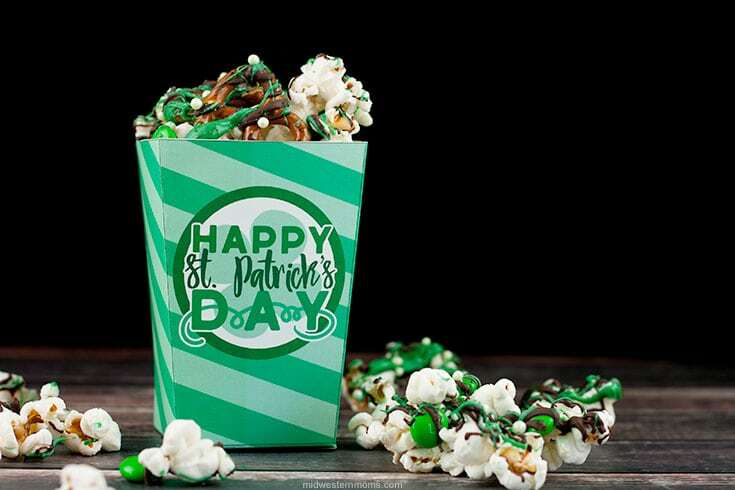 Get the free printable St. Patrick’s Day Treat Box. 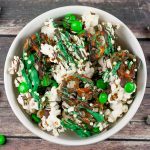 Easy to make St. Patrick’s Day Popcorn Snack Mix! 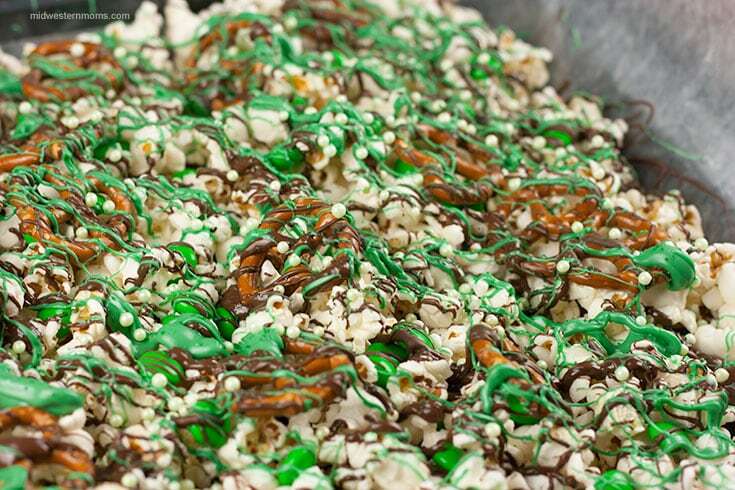 Spread the popped popcorn out on a wax paper lined cookie sheet. 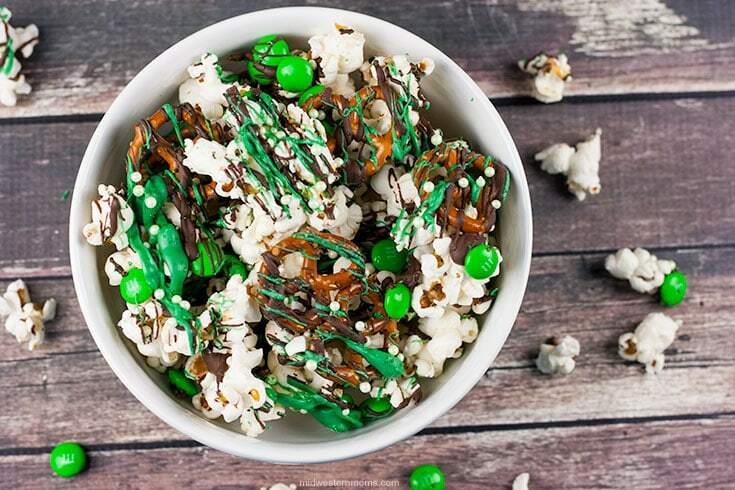 Sprinkle the M&Ms over the popcorn. Lay the pretzels out over the popcorn. Melt the Dark Chocolate according to the instructions. Drizzle over the top of the popcorn. 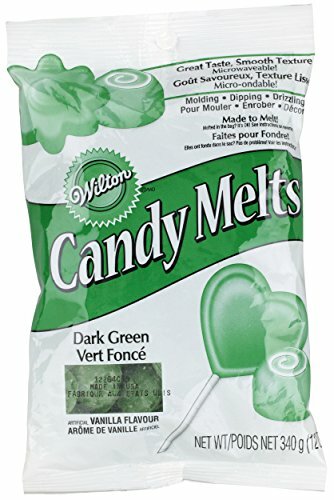 Melt the green candy melts according to the instructions. Drizzle over the tops of the popcorn. Add sprinkles before the chocolate and candy melts harden. 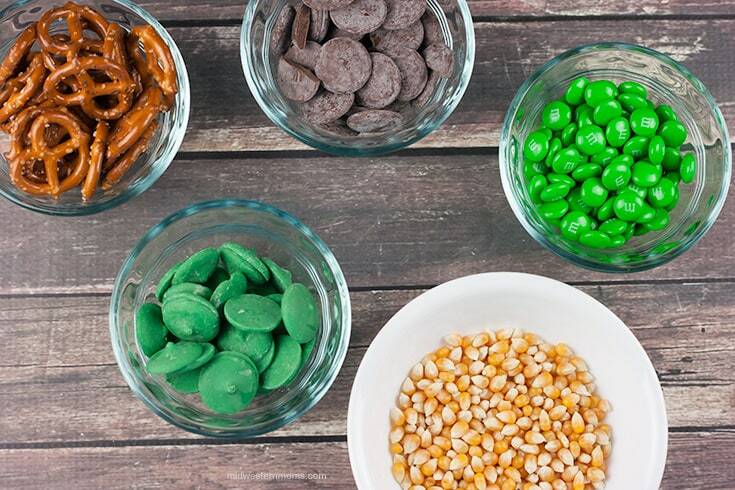 Allow the chocolate and candy melts to harden before serving.